A beautiful summer salad that is light and refreshing. 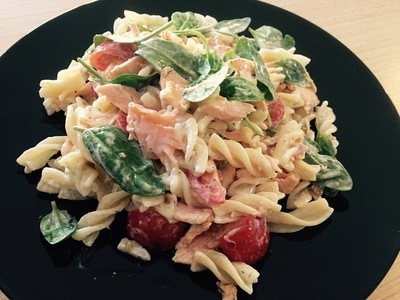 The salmon in this recipe is delicious and is a perfect match with the mayo/yoghurt dressing. Easy to prepare and a favourite in our household. Enjoy! Cook pasta in a large saucepan of boiling water with a pinch of salt until tender. Drain and run cold water over it. Remove to salad bowl. Dice red onion and chop cherry tomatoes in half. Add to pasta with spinach leaves. In another bowl, combine dressing ingredients and season. Put in the fridge to cool while you prepare salmon. Lightly oil and season both sides of the salmon. Heat fry-pan with a little oil over medium-high heat. Place the skin-side down on the pan first and cook for 3-4 minutes each side. Leave to rest for 10 minutes. 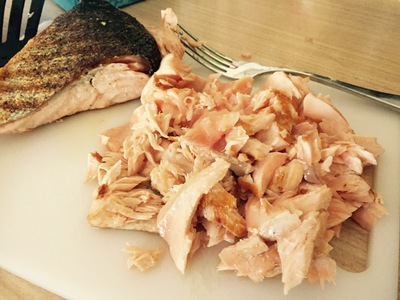 Use a fork and flake salmon away from the skin. It should flake easily if it’s cooked properly. 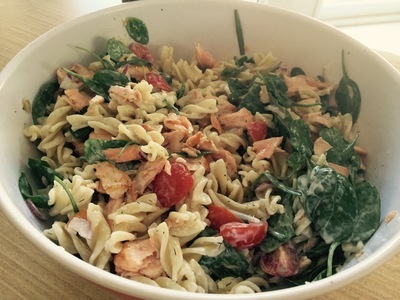 Toss salmon over the pasta mixture. 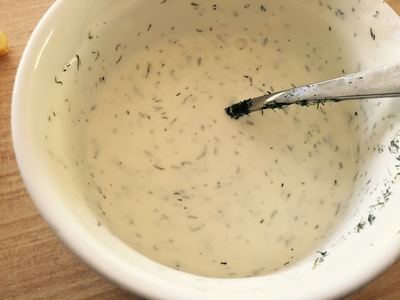 Spoon dressing over salad and mix together to combine. Serve.